The Great Gatsby by F. Scott Fitzgerald is considered one of the greatest works in American literature, delving into the corruption and materialism that many say plagued the illustrious but decadent Roaring Twenties. Ridden with booze, self-indulgence and a consumeristic vibe, the story remains influential and culturally significant to portraying such a controversial time Fitzgerald himself struggled within. A number of inevitable film adaptations have been born from the material; but would you ever consider it apt for a $100 million production with some of the biggest actors in Hollywood, a strong focus on visual effects and over glorified 3D imagery? Well, Baz Lurhmann sure did. And strangely, I like it. Nick Carraway (Tobey Maguire) is a depressed alcoholic eaten up by a past trauma - one his doctor eventually says should be written down to exploit his solace in writing. 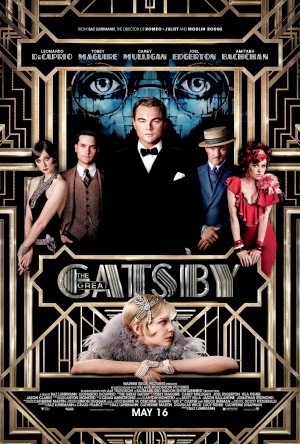 The story he reveals is of a man named Jay Gatsby (Leonardo DiCaprio), a person he considered full of hope and determination, who has mysteriously acquired a fortune after the first World War and uses his wealth to hold extravagant parties to rekindle a lost relationship with his former lover, Daisy Buchanan (Cary Mulligan). As the time passes, Nick is dragged further and further into a mishmash of his and others indulgent desires; and into a culmination of events that leaves disastrous consequences. The Great Gatsby often feels like an urban version of Tim Burton's Alice in Wonderland, or perhaps Avatar or Oz the Great and Powerful. While I'm partially joking, it's hard to deny the films backgrounds and sweeping camera shots are crafted mostly from richly vivid CGI - Lurhmann's depiction of the buzzing atmosphere of 1920s America is near perfect and evokes a sense of luxuriousness that the audience, much like the characters, gains from negative, indulgent happenings. Lurhmann has flawlessly conveyed a visual depiction of the outrageous culture, but an anachronistic if memorable soundtrack doesn't quite fit the mood or time period and can often create jarring tonal shifts. Whoever was in charge of casting for this film was inspired - DiCaprio was born to play the eponymous role as many are saying and Maguire shares a fantastic chemistry with him. The supporting cast of Mulligan and Joel Edgerton bring more finesse to the string of performances and a well written script ensures Gatsby is consistently entertaining. The only real narrative issue is with pacing, which is a tad conflicted during the opening and ending portions where the film races along at a relentless speed without much care toward development and focus. There are also some moments where things tend to drag, but thankfully these aren't common annoyances. The character of George Wilson who many know turns out to be extremely important is crucially under developed, which is something several other characters also suffer from. These grudges aside, The Great Gatsby is a compelling and visually rich drama that remains faithful to Fitzgerald's original story - but is further brought to life by exceptional performances and fantastic production design. If you're a fan of the novel, go and see it, old sport.